You've no doubt seen what this saw looks like after it has been used for 100 years, but here's one that is like the day it left the hardware store. 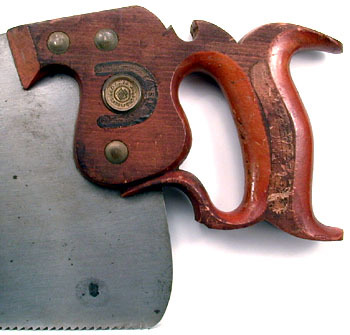 From around 1895, this saw is perfect in nearly every way. It is a 26" 7 ppi rip saw. An unusual size, perhaps that is the reason that it was never used. Made from 1840 right up until 1966, this saw was one of the longest running in the Disston line. The handle on this, and all Disston No. 7 hand saws were made of American Beech. Most came with 4 brass screws, although some saws shorter than 26" came with only three. You will no doubt notice the two paper labels that are still fastened to this saw. Often remnants of these labels are found clinging to the handle if the saw has not been used much. On this saw, from the looks of the label, it hasn't been used at all. "Years Of Competition Against All Kinds Of Prejudice Has Proved--THIS SAW--To be Superior To Any Other Manufacture. Thousands Testify To This Fact." "Beware of Counterfeits of our No.7 Saw"
The world of saw making was fraught with firms who would copy a successful design and use it as their own. The label on the grip part of the handle was no doubt referring to a saw that the Richardson Brothers made, which had a nearly identical handle and overall look. A particularly good shot of a very crisp etch.